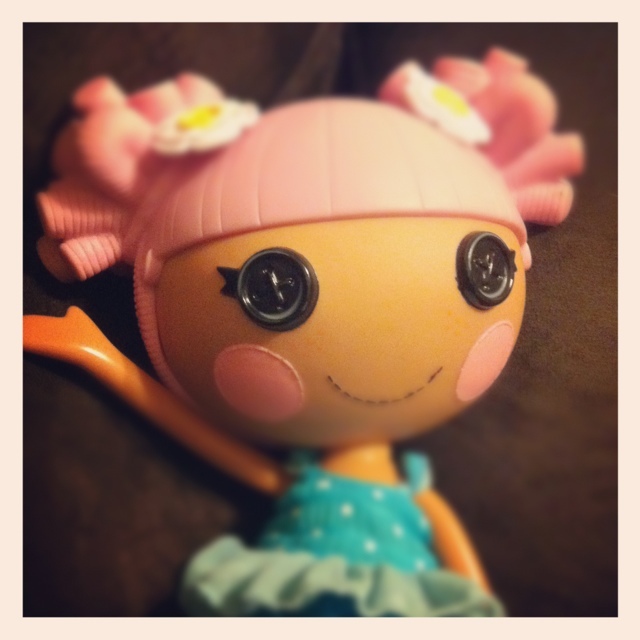 I haven’t decided yet whether Lalaloopsy is cute or creepy. Those button eyes seem to follow a person around the room with their lack of depth, the buttons remind me of the x’s in old cartoons that signified one of the characters had died. We watched a lot of Twilight Zone as kids and the two most terrifying episodes were the ventriloquist dummy that came to life and the babydoll that would appear on the stairs to make people fall. Her head would turn and scare the pants off of us. I also was scared by the one with the little boy that kept saying he was talking to grandma on his toy phone. Of course his parents wouldn’t believe him, but then at the end of the show the dad drove by the cemetery where grandma was buried and there was a phone line going into her plot! Ahhhh!!! Now I’m scared to turn off the lights for bed because the phone isn’t back on the hook (what if it rings when I’m returning it to its cradle?!?!) and Lalaloopsy is sitting on the couch watching my every move. Don’t even get me started on the whole white noise tv screen and Poltergeist. And clowns. One of my mom’s friends used to crochet clowns that were nearly as tall as us, every night before bed those things were stuffed in the back of the closet with the door firmly shut. I still have that clown, it’s living in my attic. This entry was posted in Growing Up, Instagram, Parenting, Project 366 and tagged button, doll, eyes, Instagram, Lalaloopsy, poltergeist, project 366, scary, twilight zone. Bookmark the permalink.